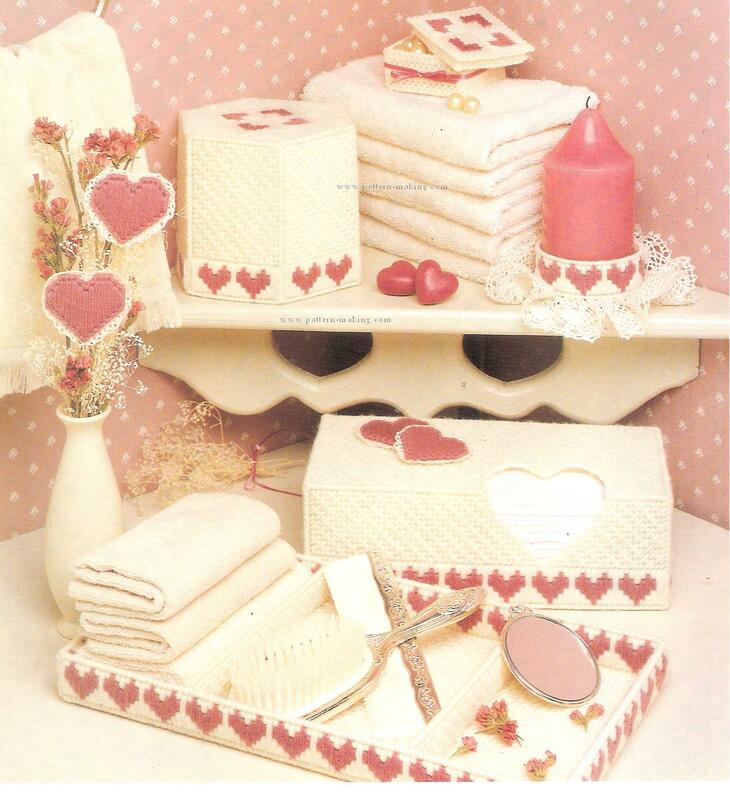 Discover the romantic appeal of hearts for the bath. Our lovely ensemble will cover your tissues and collect your trinkets with style.You can also stitch individual hearts to make sweet accents. Design By Teal Lee Elliott SUPPLIES FOR ENTIRE SET Worsted weight yarn (refer to color key), ten 10-5/8″ x 13-5/8″ sheets of 7 mesh plastic canvas, #16 tapestry needle, 1 yd of 1/2 “w lace trim, 12” of 1-3/4 “w cluny lace, 20″ of 1/8” w satin ribbon, clear-drying craft glue, wooden skewer, and candle STITCHES USED FOR ENTIRE SET Diagonal Mosaic Stitch, Gobelin Stitch, and Overcast Stitch TISSUE BOX COVER Size: 10-1/4 “w x 3-1/4 “h x 5-1/4 “d (Note: Fits a 9-1/2 “w X 2-1/2 “h x 4-3/4 “d tissue box with off-center oval opening.) 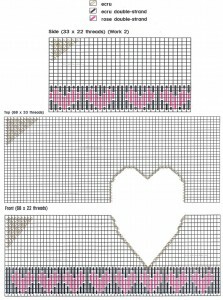 Instructions: Follow charts and use required stitches to work Front, Top, Sides, and two Hearts. 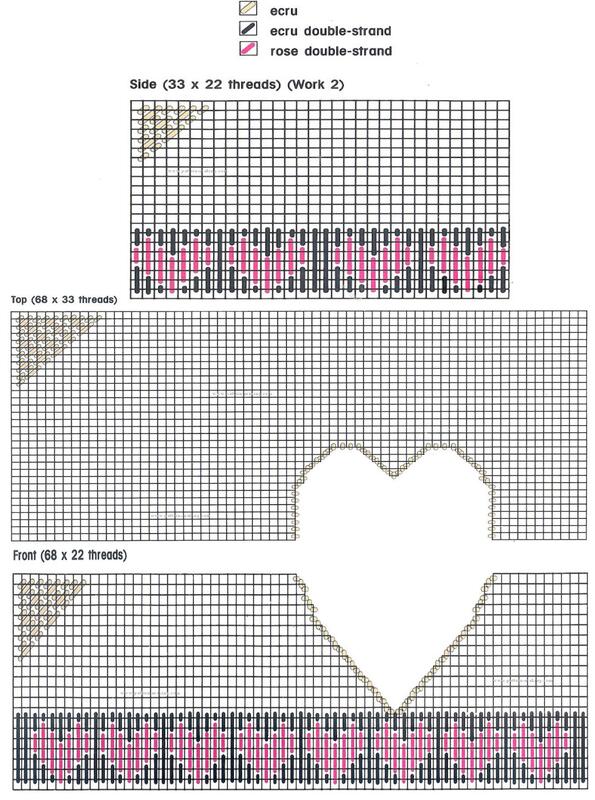 Complete backgrounds with Diagonal Mosaic Stitches as shown on charts. For Back, cut a piece of plastic canvas 68 x 22 threads. Follow Front to work Back. Complete background with ecru Diagonal Mosaic Stitches. Use ecru for all joining. Join Front, Back, and Sides along short edges. Refer to photo to join Top to Front, Back, and Sides. Use ecru Overcast Stitches to cover unworked edges. Refer to photo to glue 1/2 “w lace trim to wrong sides of Hearts. Glue Hearts to Tissue Box Cover. TRINKET BOX Size: 3″w x 1-1/2″h x 2-7/8″d Instructions: Follow charts and use required stitches to work Trinket Box pieces, leaving shaded area unworked. Use ecru for all joining. Join Top Sides along short edges. Match unworked corners of Top Sides to wrong side of Top at ‘s. Work stitches in shaded area on Top to join Top Sides to Top along placement line. Join Bottom Sides along short edges. Match unworked corners of Bottom Sides to wrong side of Bottom at ‘s. Join Bottom Sides to Bottom along worked edges. Refer to photo to tie ribbon in a bow around box. PLANT POKE Size: 2″w x 1-7/8″h Instructions: Follow chart and use required stitches to work Heart. Refer to photo to glue 1/2 “w lace trim to wrong side of Heart. Glue wooden skewer to wrong side of stitched piece. TISSUE ROLL COVER Size: 5-1/2 “w x 5″h x 4-7/8″d Instructions: Follow charts and use required stitches to work Tissue Roll Cover pieces. 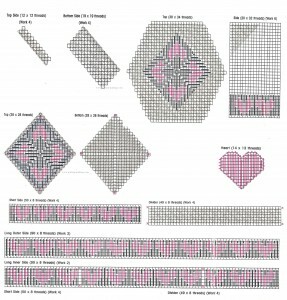 Complete backgrounds with Diagonal Mosaic Stitches as shown on charts. Use ecru for all joining. Join Sides along long edges. Join Top to Sides. Use ecru Overcast Stitches to cover unworked edges. VANITY TRAY Size: 14″w x 7-1/8″h x 1-1/4 “d Instructions: Follow charts and use required stitches to work Vanity Tray pieces. For Bottom, cut two pieces of plastic canvas 90 x 50 threads each. (Note: For durability, stitches are worked through two layers of plastic canvas.) Work Bottom with ecru Diagonal Mosaic Stitches. Use ecru for all joining. With right sides out, join two Dividers along long edges. Repeat for remaining Dividers. Match s to join one pair of Dividers to right sides of Long Inner Sides. Repeat for remaining pair of Dividers. Join Long Inner Sides to Long Outer Sides along top unworked edges.With wrong sides together, join two Short Sides along top unworked edges. Repeat for remaining Short Sides. Join Short Sides to Long Sides along short unworked edges. Join Sides to Bottom along unworked threads. Tack Dividers to Bottom of Tray. CANDLE RING Size: 1 -1/8 ” h Instructions: Cut a strip of plastic canvas 8 threads high. Cut strip desired length plus four threads. Follow chart for Vanity Tray Long Outer Side to work candle ring. Repeat pattern as necessary to cover plastic canvas strip. Use ecru Overcast Stitches to cover long unworked edges. Use ecru to join ends along unworked edges. Refer to photo to glue 1-3/4″w cluny lace to bottom of candle ring. Slide candle ring over candle.